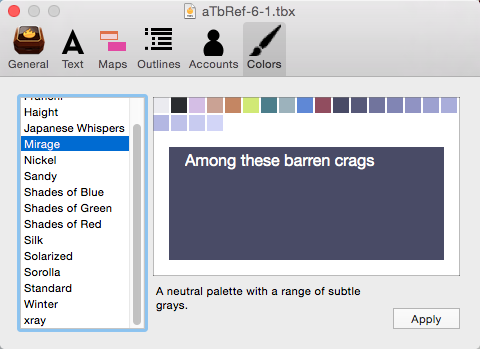 The Colors tab controls selection of the current colour scheme in use i the document. The default is 'Standard'. The list shows both built-in scheme and any stored in the Tinderbox support folders. Read mote on colour schemes. The left list box lists available scheme. When selected, a sample bitmap (if supplied) illustrating the scheme is displayed on the right.